Gov. Rick Perry on Thursday called on the federal government to pass a comprehensive energy plan with a focus on natural gas drilling and exports — and to approve the Keystone XL pipeline. HOUSTON – Gov. Rick Perry on Thursday called on federal leaders to adopt a comprehensive energy plan that would accelerate natural gas production and allow for its export — and to approve the controversial Keystone XL pipeline. 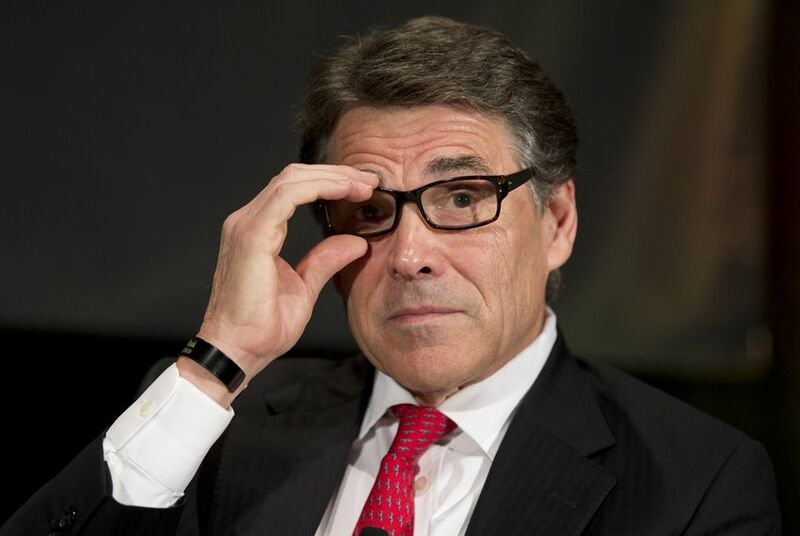 His brief reference to the Environmental Protection Agency was Perry’s only mention of the Obama administration’s June proposal to reduce carbon emissions from power plants in order to fight climate change, which was the focus of the summit. State Sen. Dan Patrick, R-Houston, who introduced the governor, promised to “hug” the oil and gas industry and to “fight back against the EPA,” but focused the rest of his remarks on protecting Texas’ surging natural gas industry and finding more ways to use that fuel. Federal regulators have suggested that transitioning toward natural gas from coal is one of the biggest steps Texas can take towards meeting their proposed rules. “It’s here in Texas, it’s cheap in Texas, and it’s clean in Texas,” Patrick said. Perry’s remarks came in a rare joint appearance with Patrick — following a fundraiser in Houston that both attended. Their talks came after a series of panel discussions hosted by the foundation questioning the science of climate change and blasting the EPA’s carbon reduction plan. Under that plan, Texas would need to slash carbon emissions from its power plants by as much as 195 billion pounds of carbon dioxide in the next 18 years, according to a Texas Tribune analysis. Earlier in the day, the audience heard from a panel of four scientists, three of whom expressed skepticism about the overwhelming scientific consensus that humans are the chief contributors to a warming planet. “The media gets to control how these things are presented,” said Roy Spencer, a climatologist at the University of Alabama and a former NASA scientist who identified himself as a “skeptic in the field” of climate science. “This is science that is driven by the funding machine,” he added. Spencer’s work has been quoted widely by Bryan Shaw, chairman of the Texas Commission on Environmental Quality, and he has been featured at previous TPPF events. Spencer and two other scientists on the panel heavily criticized the work of the Intergovernmental Panel on Climate Change (IPCC), a body of more than a thousand scientists worldwide who published a widely cited 2013 report on the state of climate science. Perry and Patrick did not address climate science in their remarks, but the summit comes as some conservative leaders in Texas say the state may need to evaluate its recent approach of suing the EPA and refusing to follow its regulations. The last time Texas refused to follow federal environmental rules, it triggered unintended consequences that caused a slow-down of the permitting process and prompted an outcry from the energy industry. Following a string of defeats­ in challenges to EPA rules, two state regulators and a former lawmaker are among those suggesting that Texas should think beyond litigation when planning how to respond to the federal proposal. “I don’t think we want to ignore the litigation route, but I think we need to look at what we need to do — away from challenging it in court,” Texas Railroad Commissioner Barry Smitherman said last month. Perry had previously called the EPA proposal the “most direct assault yet on the energy providers that employ thousands of Americans, and fuel both our homes and our nation’s economic growth.” But his name was absent from a letter 15 Republican governors sent this month to Obama urging him to drop the regulations. Nashed said the state would provide a formal comment ahead of the December deadline. Texas was not one of the 12 states that sued over the proposal last month. A spokeswoman for Attorney General Greg Abbott told the Tribune that it is rare for Texas to litigate before a rule becomes final. Averitt is now chairman of the Texas Clean Energy Coalition, a nonprofit that promotes natural gas, solar and wind energy. He said Texas is well-positioned to follow the proposed federal regulations and that the state “stands to gain a tremendous amount” by shifting to more renewable energy sources and natural gas-fired power.